This is perhaps the strangest credit card I have ever come across. 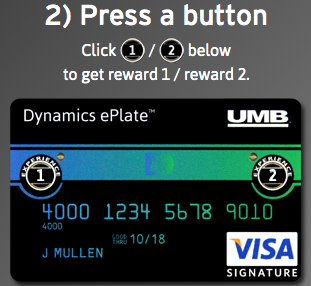 In a nutshell, the new “Dynamics ePlate” allows cardholders to constantly load and swap out new rewards on their credit card. So say one day you want to earn a free “Coffee of the Month” delivery, and another day you want to donate to a given charity. The ePlate credit card allows you to do that. In fact, it has two separate physical buttons on the credit card that allow you to load two rewards or “experiences” at once. 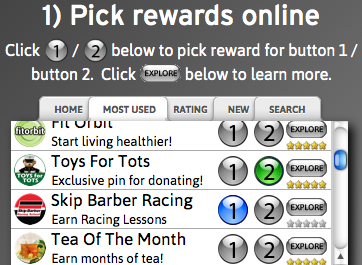 First, you pick your rewards online and associate them with your card. As mentioned, you get two, so you can load two different ones at a time. For example, let’s use the Coffee of the Month Club and Amnesty International. Every $1500 in purchases earns a free month of coffee delivered to your door. Once you earn 12 months, the 13th month is free, and you get $10 off any other coffee of the month club item. For Amnesty International, a portion of each dollar you spend goes to the charity, and you can earn a random digital song from the group’s two albums for every $100 spent. You can select a specific campaign that you want your money to go to, and once $45,000 in donations is received, it will be closed and replaced with a new campaign. When making a swipe purchase, you must select whether you want to use “experience 1” or “experience 2.” A little LED will light up to confirm which option is being used. 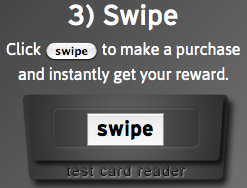 Once swiped, you instantly get credit for the reward selected. These are just two of the many rewards examples – there are also options to earn so-called “Dynamics Credits” when you post about your purchases on Facebook or tweet about them on Twitter. There’s even a reward that vaccinates a shelter animal for every $350 spent, along with a slew of raffles you can enter using rewards. But at the moment, many of the companies involved seem a bit odd and gimmicky at best. Mostly “X of the month” clubs and what not. 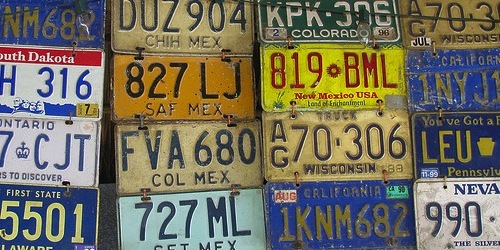 Just like other credit cards, the ePlate comes with plenty of terms and conditions. First off, there is a $99 annual fee attached to this card, which is a bit of a letdown. However, it does come with 0% APR for the first 12 billing cycles on purchases and balance transfers completed within the first 60 days of account opening. There is a 3% balance transfer fee, a 2% cash advance fee, and a 2% foreign transaction fee. After the introductory APR expires, the standard credit card APR rises to between 13.99% and 17.99, based on cardholder creditworthiness. All in all, I’m fairly unimpressed with the ePlate credit card. It appears as if this type of on-card technology would have made more sense before everything went digital. After all, there are now automated programs such as Wallaby that allow cardholders to maximize rewards from multiple credit cards with the use of one physical card. Additionally, the rewards associated with ePlate are pretty unremarkable, though this could be because the company is so new. Still, with the $99 annual fee and somewhat confusing process associated, I would give it a pass for a standard cash back rewards card where one can decide how they want to spend earnings.